Cattlemen’s Steakhouse has expanded its legendary food and outstanding service to Special Events and Banquets. Special Events range from Corporate Dinners, Birthday and Retirement Parties, to Rehearsal Dinners and Murder Mystery Theatre. We provide a wonderful selection of hand-cut steaks from our butcher shop. We pride our banquets on providing excellent food with a great meeting space for your next special event. Plated meals as well as buffets, and heavy hors devours are offered. 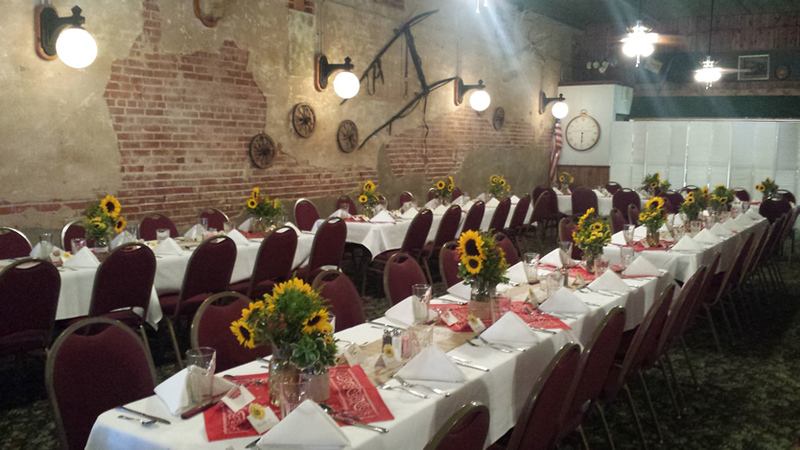 We have a whole building with banquet rooms available to accommodate your groups specific event needs. The "Cattlemen's Special Event Center" is located next door to the restaurant. Admire the long antique bar in the “High Noon Saloon” Bar for your next cocktail hour. The entire Event Center can seat up to 170 guests or be shared to accommodate smaller groups in the separate rooms. Perfect for your next fundraiser, rehearsal dinner, family reunion, or corporate dinner party or seminar. Available 7 days a week for breakfast, lunch, and dinner. All Banquet Rooms have full wi-fi capabilities, microphone, podium, and projector screens upon request at no additional charge. Come visit our Special Event Center to plan your next Perfect Event.